Whether you’ve considered bankruptcy or are on your way out of the process, even the concept of taking out a home loan can leave you feeling financially fragile, and with little of the American Dream to call your own. Before taking the plunge into the housing market and shopping for a home loan in the wake of the recent recession, it’s always best to understand a bit more about how you can make a mortgage work for you, your credit, and, most importantly, your family budget. With a fixed rate loan your payment generally stays the same throughout the life of your loan at its initial borrowing amount. Understand that you can get a lower interest rate for shorter-term loans such a 15-year fixed rate loan, as opposed to a 30-year loan. Keep in mind also that securing a lower payment with a longer term will mean paying a lot more interest, and therefore you’ll pay more on the total loan throughout the loan life. 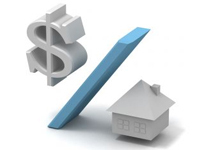 Payments on adjustable rate mortgages (otherwise known as ARMs) change through the life of the loan. Adjustments are made to the interest rate of the loan based upon the defined index the loan uses, such as a Treasury Bill (T-Bill) or Cost of Savings Index (COSI). Keep in mind that you may begin with a lower rate than a comparable fixed-rated loan, but that ARMs were a large part of creating a housing crisis for many average Americans unable to pay their mortgages when their ARMs (and their adjustable rates) became unmanageable. A convertible mortgage starts out as an adjustable rate mortgage, but after. a specified amount of time, you can convert your ARM to a fixed rate mortgage for a fee. Many borrowers just like you use a convertible mortgage when they think rates will come down in the future. Balloon loans are short-term mortgages that have some features of a fixed rate mortgage, providing a level payment feature during the term of the loan; however, at the end of the loan term there is still a remaining principal loan balance and the mortgage company generally requires that the loan be paid in full by refinancing. While some may take advantage of the mortgage loans above, many average Americans continue to reel from underwater housing conditions whereby many millions of homes are worth less than homeowners owe. This unfortunate financial environment is locking many into deepening real estate loan scenarios that are, in many regards, sucking dry their much-needed savings while also creating a situation where they must “stay put” in homes without equity that they can no longer afford. In the current economic malaise, where so many face job insecurity, underemployment and unemployment rates, being forced to stay in the same place in a search for better income is hampering many people’s efforts to move onward and upward, post-recession. So, as American homeowners search for more immediate and steady help with their own personal housing crises, many are instead turning to the simplicity of bankruptcy to stop an impending foreclosure and other creditor actions. If you too have been affected by the housing crisis, a qualified bankruptcy attorney can help. The bankruptcy lawyers at the Law Offices of John T. Orcutt offer a totally FREE debt consultation and now, more than ever, it’s time to take them up on their offer.